Natural beauty meets human creativity in the Churnet Valley. 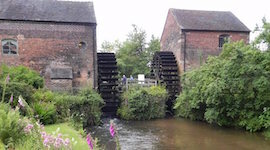 Beautiful woods, fine views, attractive villages and the sounds of canal and railway. It is not surprising that the landscapes of the Churnet have inspired artists and writers, including George Eliot and William Morris. It has also attracted fine architects, including Augustus Pugin, whose buildings add to the attractiveness of the valley. The valley remains a source of inspiration for artists, photographers and craftspeople – as well as for people who simply enjoy spending time in lovely places.